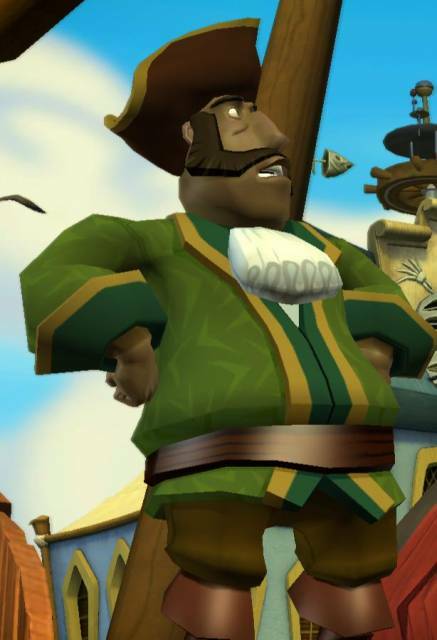 Reginald Van Winslow is a supporting character in Tales of Monkey Island who serves as the protagonist Guybrush’s first mate. 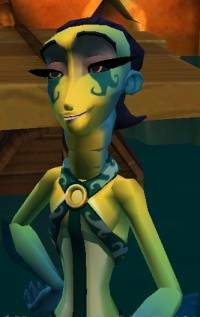 Throughout the game, Van Winslow is flirtatious with Guybrush, and seems to have a fetish for maps/people using maps. Notably Van Winslow has an especially flirty rapport with Anemone, who is an ambiguously gendered merperson. He eventually has a sexual encounter with Anemone, which serves to further confuse Guybrush due to Anemone’s unknown gender. Anemone is capable of somehow “producing” eggs, which has led fans to speculate that they may have “female” reproductive organs, but their gender is still unspecified in the game. Some cut scenes in this Let’s Play of Tales of Monkey Island allude to a relationship between Van Winslow and Anemone. This entry was posted in 2000s, Bisexual, Bisexual (implicit), Characters, Non-binary or genderqueer, Non-binary or Genderqueer (implicit), Queer Men on May 25, 2016 by Adrienne Shaw.